The Naval Research Laboratory (NRL) Technology Center for Safety and Survivability (NTCSS) is soliciting for research and development services for a wide variety of survivability and fire protection research, development, testing and evaluation. 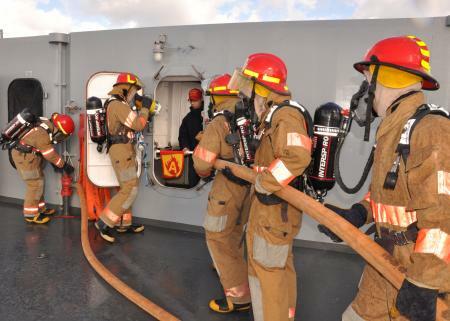 The contract will support firefighting readiness and capabilities for surface ships, submarines, aircraft, land vehicles and shore-based facility applications for both the Navy and other Department of Defense (DoD) organizations. NTCSS conducts applied research and development studies to help solve current and future Navy problems in the fields of combustion, fire modeling and scaling, fuels and environmental hazards, and fire extinguishing. The expected place of performance for this requirement is Naval Research Lab, Washington, DC (NRL-DC); NRL Chesapeake Bay Detachment (CBD), located in Chesapeake Beach, MD; NLR-Fire Test Ship, ex-USS SHADWELL, located in Mobile, AL, and at various contractor and subcontractor facilities. The government estimates the value of the contract to be $6,400,000. Further details are available under Solicitation Number: N00173-14-R-BZ01. The response deadline is August 22, 2014. Image: Sailors from the amphibious command ship USS Mount Whitney simulate combating a class alpha fire, courtesy of DVIDS.